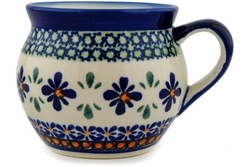 Polish pottery potbelly mug. Hand-painted polish stoneware holds both heat and cold for extended periods and is durable enough for everyday use. This beautiful stoneware mug fits comfortably in your hands and is guaranteed to become your favorite. Be sure to complement these nice potbelly mugs with other stoneware dinnerware available on our site.